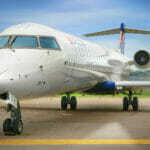 When it launched in 2005, St. Louis-based GoJet Airlines served just five destinations with a fleet of five Bombardier CRJ700 aircraft. 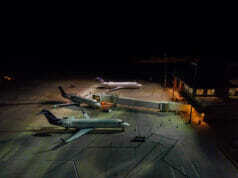 It had just one crew base (STL) and one mainline partner (United). However, as it prepares to celebrate its 10 year anniversary on October 4, GoJet’s reality is markedly different. Today GoJet serves over 4 million passengers annually, with more than 220 daily flights providing service to over 50 destinations. 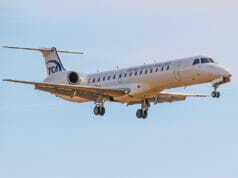 Its fleet of five aircraft has grown to 47 CRJ700s, with 7 CRJ900 aircraft slated for delivery in 2015. 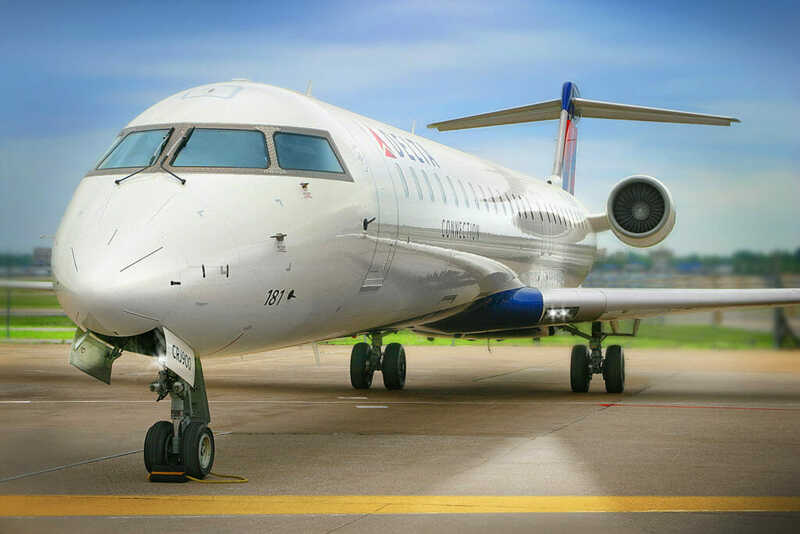 Since 2005, it has added an additional mainline partner (Delta Air Lines) and its one crew base has grown to four, with domiciles in Chicago (ORD), Raleigh-Durham (RDU) and Denver (DEN) added to accommodate the airline’s significant growth. GoJet attributes much of its success over the past 10 years to its employee group. “Our employees are truly one of a kind,” said Steve Briner, Director of Flight Operations. “The dedication and commitment that they have to the success of the operation is simply amazing.” GoJet promotes from within whenever possible, which Basham and Briner believe to be a driving factor in employee satisfaction, as the policy gives employees significant upward mobility opportunities over the course of their careers. GoJet takes pilot satisfaction particularly seriously and offers a number of additional competitive benefits to its pilot group. 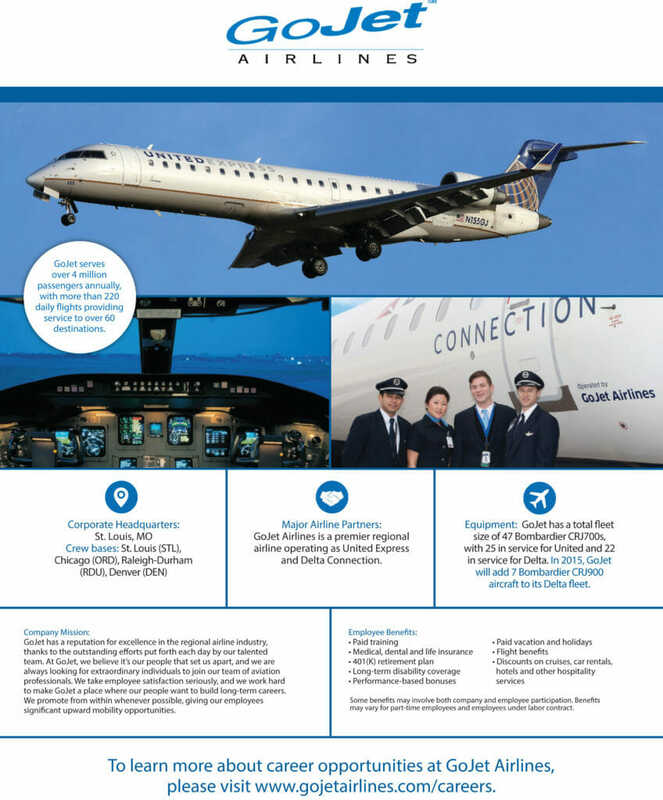 Monetary incentives include a $10,000 First Officer sign-on bonus, which goes up to $15,000 for pilots who are current and qualified with a CRJ type rating. 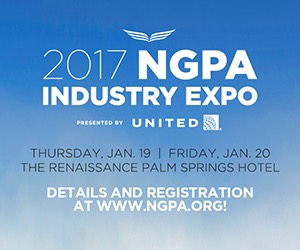 GoJet also offers a mentor program that allows pilots to earn an additional $5,000 for mentoring a new GoJet pilot through their first two years with the company, and a referral program that awards employees $1,500 for each pilot candidate they recommend that is hired and completes training. In addition to cash bonuses, GoJet provides a number of other financially advantageous benefits to its pilots. GoJet offers one of the most competitive commuter policies in the industry, paying for up to four hotel nights per month for crew members living outside of their domicile. Additionally, the ATP-CTP course is provided at no cost to successful applicants and GoJet one of just a handful of regional airlines in the country to participate in the ATP Flight School Tuition Reimbursement Program. GoJet is currently hiring 34 pilots per month and upgrading 10 Captains per month, with the number of monthly Captain upgrades expected to increase over time. GoJet pilots are well-respected and highly sought after in the industry, with 34% of its pilot group moving on to the majors in 2014. With a track record of well-managed, successful growth, demonstrated pilot career success, and some of the best pilot incentives out there, GoJet is a smart choice for pilots looking to launch their commercial careers or gain additional hours before making the move to a major carrier. To learn more about what GoJet has to offer, reach out to a pilot recruiter directly at pilotjobs@gojetairlines.com or apply online via airlineapps.com. Randy: Applicants are screened on-line through Airline Apps. R: No point system is used at this time. We look for applicants with ATP minimums and a background we believe will allow them to be successful in our program. R: While not necessary, it can generate an on-site interview. R: Be thorough and honest in the interview process. Speak to your training history. Be able to discuss some basic aviation topics such as a METAR/TAF, approach plate and the aircraft you have flown. R: Yes. While not necessary, it may help you feel more rested. R: TMAAT questions are common. R: Not being honest with work history and experience. Not appearing prepared and unable to articulate flying experience. R: We attempt to make a conditional offer on the day of the interview. R: Within a week of the interview at the very most. R: Inside of two weeks or as soon as the applicant is available. R: Approximately 300 between now and the end of the year. We are running classes twice a month and targeting up to 20 pilots per class. R: Contracted through a private vendor with transportation and lodging paid for by GoJet. Additionally, GoJet will reimburse the cost of the ATM test (new ATP written exam). C: Do you have a hiring bonus? R: Yes. $10,000 paid out in three installments. (1) $3500 at the completion of IOE (2) $3500 six months thereafter (3) $3000 to be paid on the 359 day of employment. 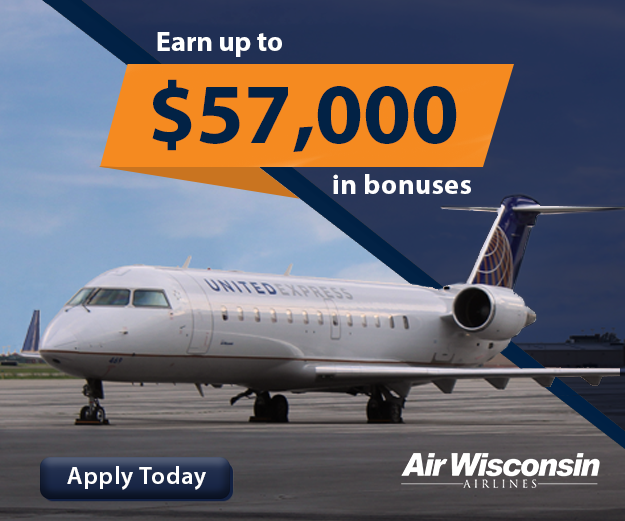 That bonus goes up to $15,000 for pilots who are current and qualified with a CRJ type rating. 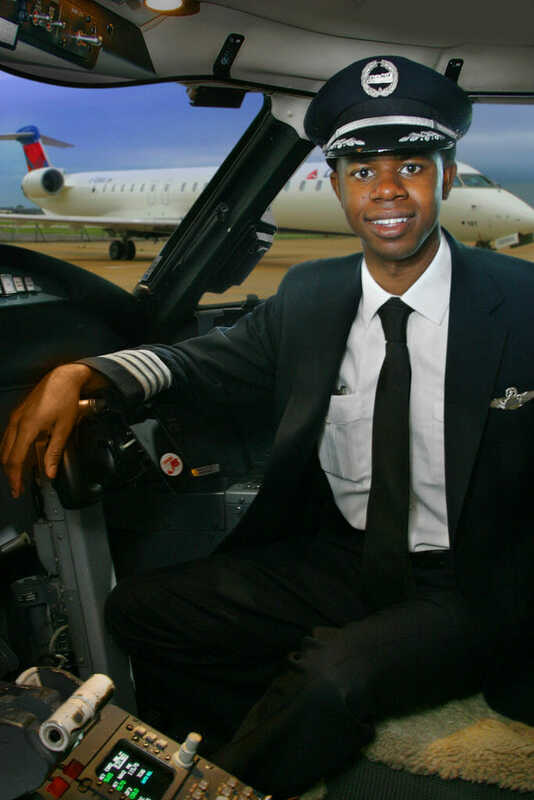 Additionally, GoJet has recently put together an agreement with ATP Flight School which is designed to assist in financially offsetting the cost of getting a CFI from the 500 hour point through his/her first year of employment as an airline pilot at GoJet. C: Is there any specific criterion to qualify for the bonus? Also, at this time, pilots are allowed to participate in only one of the above programs. When GoJet Airlines was launched 2005, we served just five destinations and had a fleet of only five Bombardier CRJ700 aircraft in service for United Airlines. Today GoJet serves over 4 million passengers annually, with more than 240 daily flights providing service to over 60 destinations. We now provide service for both United Airlines and Delta Air Lines, and our fleet of five aircraft has grown to 47 CRJ700s, with 7 CRJ900s. 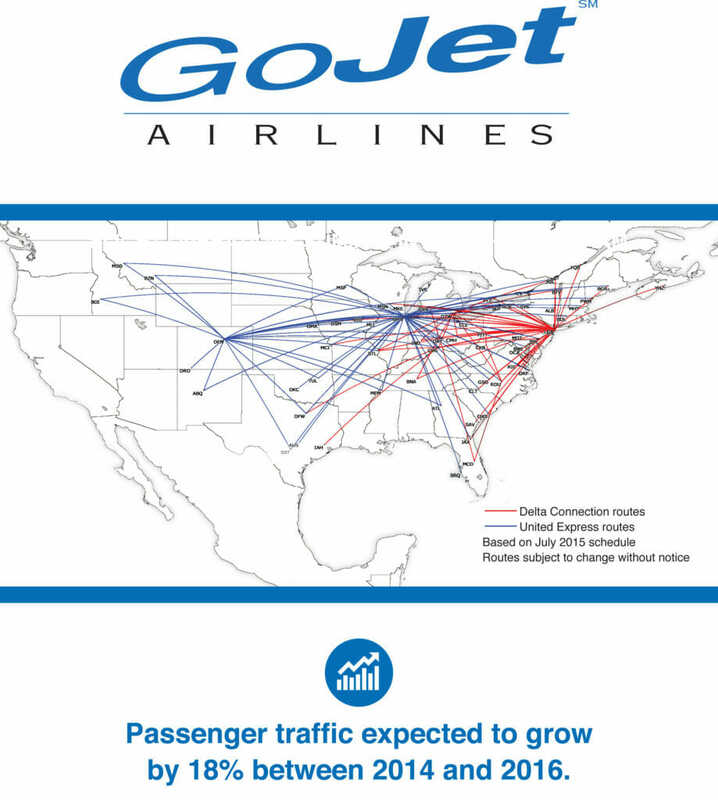 GoJet has a reputation for excellence in the regional aviation industry, which is evident in the rapid growth we've enjoyed since our inception. From day one, we've demonstrated an unwavering commitment to providing safe, reliable and on-time air transportation, and to delivering the highest standards in professionalism and customer service. Even though we've grown, we've remained committed to the ideals upon which we were founded, and each day is a new opportunity to provide a superior travel experience for all of our passengers. We look forward to welcoming you onboard!